Another story about a local shred who got broke off. Let's help him out. You want to drink on St. Patty's Day anyway, right? I don't even know this guy, but it could easily be me. He broke his leg and needed an heli-lift to safety. 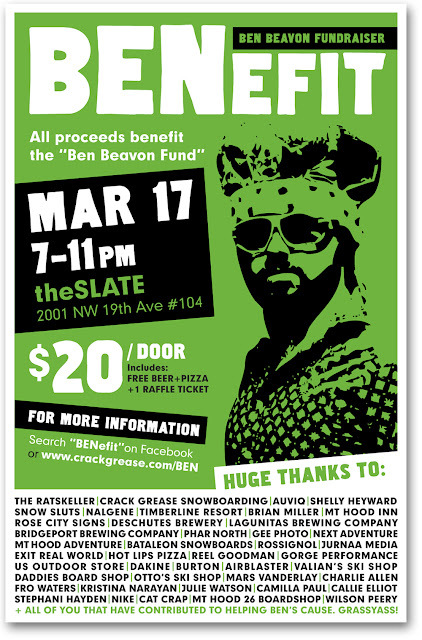 Why not drop a couple bucks, buy a raffle ticket or two and get this guy out of his wheelchair and back up on a snowboard. For all the details, check Crack Grease Wax. damn, they say you can measure a man by his friends. Dude's got a lot of friends!